Back to school means another program year is kicking off all around the territory. With Troops coming back, surely leaders’ minds are actively brainstorming which emblems to work on first, and, with so many choices, it can be exciting and a bit tedious to figure out just which ones will work for the corps, the youth, and the leaders. 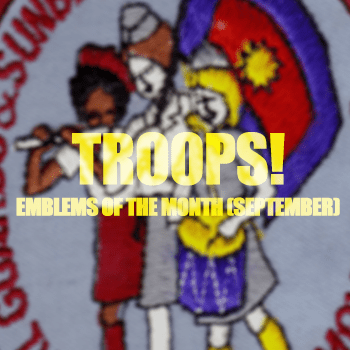 This month, use this opportunity to explore The Salvation Army emblems to answer these questions for the young people and to properly introduce them to your corps. Each troop has a badge in this category, so you could use this time to have them work alongside one another on larger activities. Click on these links below to download a pdf of each emblem. Since each troop can earn two emblems a month, why not take the opportunity to get to know more about each of your kids? This month includes National Keep Kids Creative Week! Use this time to learn about their skills by checking out one of these emblems that focus more on creativity – music, drama, the arts. As always, check us out and follow us on Pinterest as we are always adding to our emblem boards to help find ways to enhance each badge. Hi, what is the lay people user info for youth resource library? We got it at boot camp 2 I think. . . Need it for troops. Thanks. Hey Misty! Thanks for the question/comment. We have access for lay people and I can email you that information. But in the mean time, if you’re looking to access JR. Soldiers or Moonbeans, hover your mouse over the Youth Resource Library menu item and the tabs should appear below it. That’s a wonderful suggestion. We’ll be more than happy to crete one for October! Be on the look out!